This movie is the latest in the “The fast and the furious” franchise. In this movie they use the actors that played in the first four releases which I thought was pretty nice. The beginning of the movie follows up the ending of the fourth when Dominique(Vin Diesel) escapes from jail. Now when people say “The fast and the furious” they think “Drag racing”, “Tuning”, etc… But in this latest release it’s not at all about that. It’s not only about racing and see what car is the fastest, but there is an actual story. The storytelling reminds me a bit of “The Italian Job”. The story is simple: Trying to steal all of the money of a mafia boss that runs Brazil. Although I like there’s a nice story I also miss the racing part. There aren’t many tuned cars anymore and the races are reduced to a minimum. The movie isn’t bad though and I must say that the actors did a nice job. 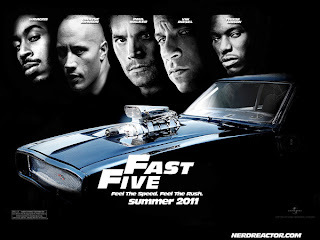 In short: The fast five is a nice movie which will not only attract the franchise fans but also many other people. What I hope though is that there will be a nice balance between racing, tuning and storytelling in the next one because this one lacked a bit of the first.